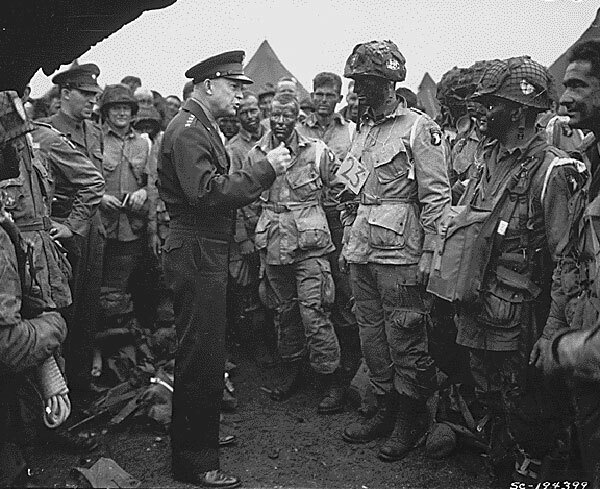 On June 5, 1944, the eve of the largest invasion in history, General Dwight Eisenhower visited the English airfield where paratroopers were preparing to take off for their drop into France. “Quit worrying, General,” one of the soldiers told him. “We’ll take care of this thing for you.’’ The following day, 175,000 men landed on the beaches and fields of Normandy. For children growing up in Washington, D.C., shushed into silence behind the blackout curtains while our parents bent over radios bringing the long-awaited announcement of the attack, it was all beyond comprehension–save that every little boy was climbing into a tree to pretend he was flying his Spitfire over the Channel, or parachuting into the French countryside. At age seven, I was one of those boys. Last week I had the good fortune to meet another member of my generation, whose experience of D-Day was something quite different. His name is Pierre Bernard, and he is retired to his family’s farm in the village of Maisons, a stone’s throw from the beaches that became the site of what the French call the Débarquement. In the spring of 1944, Pierre was twelve; with his parents and siblings, he worked the farm and waited for the Allied troops to arrive and free them from Nazi occupation. When that day finally came, Pierre recalls, the Germans simply vanished. British and then American troops soon passed through the village, moving quickly inland. His family was luckier than many others: Some 12,000 French civilians were killed during the battle for Normandy, along with more than 75,000 troops on both sides. Today, long retired from his job as a cook in Paris, Pierre oversees a bed and breakfast in his old stone farmhouse. He’s never learned to use a computer, so his daughters help arrange who is to come, while Pierre, along with his two dogs, goes out each morning to bring back fresh baguettes and croissants. He serves them along with the jams and pates he makes himself, and sits quietly at the head of the family table, contentedly watching his guests eat breakfast. And he’ll gladly trade war stories with a visitor who, like himself, is too young to have fought, but old enough to remember. Normandy today still inspires awe at the courage of the men who stormed Fortress Europe: Omaha Beach, so wide and unprotected; the cliffs of Point du Hoc, higher and steeper than I could have imagined. But by now, the genuine remnants of the war—half-buried German bunkers, wrecked ships, and thousands of well-tended graves—are outnumbered by nostalgic renderings of the real thing: Army surplus stores are filled with Eisenhower jackets, berets, and rucksacks (many of them supplied by German companies). Towns compete for tourists–and a place in history—with tanks on their village squares and little museums dedicated to every aspect of “Jour J.” In Sainte-Mère-Église, where an American paratrooper famously got caught on the church steeple, a dummy is suspended from a parachute to commemmorate the event. Then there are the British and American visitors tearing around in rented World War II jeeps, windshields down, and even a half-ton olive drab truck. They look far too young to be veterans; too young even to have been alive at the time. The men and women who fought that war are fast disappearing (some 850 U.S. WW II vets die every day, according to the VA), and those who lived through it as children are now well into our old age. And what about aging Americans–including the waning ranks of the “greatest generation” that came before mine, who helped free the French and the rest of Europe, and then financed the continent’s recovery through the Marshall Plan? What can we expect? The most minimal of public pension systems, which was created before the war and has been under attack ever since; a private pension system that is now a shell of collapsing structures; personal savings decimated by Wall Street; and a partial and increasingly expensive health care system. More and more of us plan to work quite literally until we die–that is, if we can manage to keep our jobs, since we have little protection against age discrimination and no job security of any sort. In America, the war fought by “Citizen Soldiers” made our world all too safe for wealth and corporate power, often at the expense of the very men and women who won it. In France, conservative President Nicolas Sarkozy has been chipping away at the Nanny State. His latest scheme—to raise the retirement age to 62—brought mass demonstrations across the country last week, and threats from the still-powerful unions. But even if Sarkozy’s latest initiative succeeds, as it well may, France’s elders will still be better off than their American counterparts have ever been. Here in the U.S., we face a political juggernaut—most recently manifested in Obama’s “debt commission”–intent on cutting Social Security benefits, raising the costs of Medicare, extending the formal retirement age from 65 to 67 and beyond, and further tying our retirement and that of future generations to the vicissitudes of the securities markets through 401Ks and IRAs. Few voices are raised in protest against this attack on old-age entitlements. In fact, it seems to be one of the only true examples of bipartisanship in American politics, now that the Democratic Party, which once fought to build what social safety net we have, has collapsed into the arms of Wall Street. I expect it will progress with no more difficulty than “welfare reform,” in which another Democratic administration gutted our meager provisons for the poor. In a Washington Post op-ed last Sunday, American Enterprise Institute president Arthur C. Brooks declared that “America’s new culture war” is a “struggle between two competing visions of the country’s future. In one, America will continue to be an exceptional nation organized around the principles of free enterprise–limited government, a reliance on entrepreneurship and rewards determined by market forces. In the other, America will move toward European-style statism grounded in expanding bureaucracies, a managed economy and large-scale income redistribution.” If only this were remotely true. In fact, that battle was lost long ago—if it was ever fought at all. Perhaps I only imagine that Pierre’s life is more tranquil than mine because he enjoys the security that comes with “European-style statism,” while my own well-being remains “determined by market forces.” But I don’t think so. Sixty-six years ago, as a small boy playing pilot in the lush green trees of a Washington spring, I could not have guessed that Pierre, waiting in his farmhouse nestled in the hedgerows of Normandy for the jeeps and tanks of the First Army, would someday become a symbol not only of my country’s greatest victory, but of its saddest defeat. What we choose to emphasize in this complex history will determine our lives. If we see only the worst, it destroys our capacity to do something. If we remember those times and places–and there are so many–where people have behaved magnificently, this gives us the energy to act, and at least the possibility of sending this spinning top of a world in a different direction. There was nothing naive or sentimental about Zinn’s positions. He had seen firsthand the worst that humanity was capable of, and simply chose to confront it as a challenge rather than accept it as our final destiny. Howard Zinn’s legacy is the millions of people he has educated–and will continue to educate–through his personal example, his writings, and myriad projects based on his work. Here’s one of my recent favorites, an illustrated video on American empire. I published this piece yesterday on a site called Reader Supported News. It might provide some food for (wishful) thought as we prepare to listen to Obama’s State of the Union speech. With the unemployment rate still hovering above 10 percent, the bailed-out financial sector is rewarding itself with bonuses instead of making the kinds of solid investments that might produce jobs. The time clearly is at hand for the Obama administration to push the banks aside, and plunge in to shape the economic recovery on its own terms. That means using federal monies to employ out of work people in rebuilding infrastructure and launching new projects –public employment in the public interest. The benefits of the CCC went beyond their impact on the economy or the environment. A friend whose father served in the Corps told me he recalled it, to his dying day, as one of the happiest times of his life. A kid from an immigrant ghetto in upper Manhattan, his idea of wilderness was no doubt limited to Fort Tryon Park–but the CCC sent him to work in Washington state’s glorious Mount Ranier National Park. And instead of the hopelessness that came with unemployment and desperate poverty, he had a place to live, three meals a day, and the pride of sending money home to help his single mother and younger siblings. In its time, Alter writes, the mobilization of the Civilian Conservation Corps exceeded all prior efforts in the nation’s history–“and it has not been matched since.” Over nine years, more than 3 million men were provided meaningful work. The CCC would inspire numerous other programs–the Job Corps, Peace Corps, Vista, and AmeriCorps. It succeeded in the same spirit of solidarity and national service that would soon help win Second World War. Roosevelt’s bold experiment in federal job-creation demonstrated that government can work–and more than that. It showed that there are times when leadership must come not from the states or localities or the slow-moving Congress, but directly from the White House. It provides a stark lesson for the Obama government, which remains mired in a swampland of political bickering while it pursues the illusion of bipartisanship, triangulates corporate special interests, and naively supports big banks in some revamped version of trickle-down economics. The current word on the political street is that the Obama administration is bent on “going populist” in the wake of recent political defeats. And since his opponents long ago branded him a socialist (if not the anti-Christ), it seems he has little to lose. A good beginning would be to tax the $45 billion in bank bonuses at the utmost possible level, using the return to jump-start a federal government sponsored, government-run program like the CCC to employ men–and this time, women as well. Through a federally funded jobs program, they can be put to work to rebuild the nation’s rotting infrastructure; to spark public enterprise in the new energy industries, from autos to solar and wind powered electric utilities; to lay railways that criss-cross the nation and build the engines, coaches, and freight cars that will travel over them; and to construct and the staff community health centers that might fill in for a failed health care reform effort. Some version of this plan has been proposed many times during the current financial crisis, and always ignored or shoved aside because of opposition from powerful industries and their supporters, who argue that such dramatic federal action would disrupt the free market or override local initiative. Well, the market, such as it is–never really free, and usually greased to serve corporate interests–has not done the job for the millions of Americans who remain unemployed. It’s time for the president to step in and do his. I encourage you to check out the rest of Reader Supported News, an up-and-coming progressive news site. When Sibel Edmonds,the young Turkish-American translator hired by the FBI in the days immediately following 911, was blocked first by the 911 commission,then Congress, and finally by the courts, from telling what she had seen inside the FBI—the incompetence, petty intra-bureau dealngs,security breaches,along with hints that Islamic terrorists might well be intertwined with money laundering and drug dealing—one of the first people who came to Washington to defend her was Daniel Ellsberg of the Pentagon Papers fame. And it was Ellsberg, who casting an eye back to the early days of John F. Kennedy’s presidency, could talk with the depth of knowledge and certainty about how government took every means possible to hide the details of its secret dealings,in his case,the Vietnam war. He never suggested Edmonds should break the law by speaking out despite the court gags, but his example proved a steadying force among the whistleblowers of the intelligence community who began to come forward. If Ellsberg could do it, they could do it. Now, Truthdig.com is running his online memoirs of the government’s secret plans in those days that so many people have forgotten or ignored,events that took place when they were children, or not yet born.They remind me of those days in World War II when as children, we scarcely knew what was taking place around us. One day in the spring of 1961, soon after my 30th birthday, I was shown how our world would end. Not the Earth, not—so far as I knew then—all humanity or life, but the destruction of most cities and people in the Northern Hemisphere. What I was handed, in a White House office, was a single sheet of paper with some numbers and lines on it. It was headed “Top Secret—Sensitive”; under that, “For the President’s Eyes Only.” …. The deputy assistant to the president for national security, my friend and colleague Bob Komer, showed it to me. A cover sheet identified it as the answer to a question President John F. Kennedy had addressed to the Joint Chiefs of Staff a week earlier. Komer showed it to me because I had drafted the question, which Komer had sent in the president’s name. Their answer was in the form of a graph.The vertical axis was the number of deaths, in millions. The horizontal axis was time, indicated in months. The graph was a straight line, starting at time zero on the horizontal—on the vertical axis, the number of immediate deaths expected within hours of our attack—and slanting upward to a maximum at six months, an arbitrary cutoff for the deaths that would accumulate over time from initial injuries and from fallout radiation. The lowest number, at the left of the graph, was 275 million deaths. The number at the right-hand side, at six months, was 325 million. The online book will recount highlights of his six years of research and consulting for the Departments of Defense and State and the White House on issues of nuclear command and control, nuclear war planning and nuclear crises. It further draws on 34 subsequent years of research and activism largely on nuclear policy, which followed the intervening 11 years of his preoccupation with the Vietnam War. Subsequent installments also will appear on Truthdig. The author is a senior fellow of the Nuclear Age Peace Foundation. By now we’ve all heard about how Queen Elizabeth was snubbed by Nicholas Sarkozy, who was apparently so dazzled by the prospect of Barack Obama’s visit that he neglected to invite the queen to any of the events commemorating the 65th anniversary of D-Day. (In a last-minute face-saver, Prince Charles agreed to attend instead.) Some people are blaming Gordon Brown, who was too busy trying to save his political skin to make sure the queen got her due. But the British press, which is having a field day over this royal faux pas, has directed most of its rage at Sarko, and at the ungrateful French in general. The Daily Mail declared the snub “an insult to the memory of the 17,556 British and 5,316 Canadian troops who died to free France and are buried there.” Commentators in the same paper took things a step further, declaring Sarzkozy a “diminutive egomaniac,” and denouncing the French as cheese-eating surrender monkeys whose “widespread collaboration with the Nazi occupiers” made it all the more difficult for the British to “save” them from tyranny. I don’t go in for French-bashing, and under normal circumstances, I couldn’t care less about anyone in the British royal family, or any of the pomp and protocol that surround them. I think it’s great that Michelle Obama dared to touch the queen–she could have given her a fist bump for all I care. In fact, I wonder why the Brits don’t just do away with the monarchy altogether, and save themselves a lot of money. (Although they’d still have to deal with MPs cleaning their moats at the public’s expense.) But when it comes to anything having to do with the Second World War, I’ve got a soft spot for the British in general, and in particular for HRH–who lives in my earliest memories as Princess Elizabeth. I had a wartime childhood. When I was very small, we used to sitting around the radio, listening to Edward R. Murrow’s broadcasts from the streets of London during the Blitz. Later, when America was in the war and my family lived in Washington, D.C., we listened with our blackout curtains drawn. I remember hearing the news about D-Day, and later seeing the newsreels when we went to the movies. Those were the sounds and images of my childhood. Elizabeth Windsor changing a tire during her service with the ATS. I also have a clear memory of Princess Elizabeth, who was just ten years older than I was and still a teenager, speaking from the balcony of Buckingham Palace. I don’t know exactly when this happened or what she said, but I remember that she and her family seemed cheerful and apparently fearless despite being in a ravaged city, at the heart of a threatened land. Later, the princess worked as an ambulence driver in the Auxiliary Territorial Service. As the press has rightly pointed out, she is the last living head of state to have actually served in World War II. It all sounds pretty sentimental, I know. But there’s something else going on here, as well–something that has to do with age and the generations. It is widely assumed that the 65th anniversary will be the last major gathering of D-Day veterans on the landing beaches, since the youngest of them are now in their 80s. Speaking at the American Cemetery on the cliffs over Omaha Beach this morning, Barack Obama talked about a veteran of the 101st Airborne who had come to Normandy for the anniversary, and died last night in his sleep. None of the heads of state present at the ceremonies was even alive during the war. If the queen had been there, at least she would be commemorating a lived experience–not something recorded in history books and PBS documentaries, and remembered by fewer and fewer of us with every passing year.